Christmas Day is nearly here and Father Christmas is due to arrive in just over 12 hours, there is still plenty of time to make some home made Mince Pies to put out for him tonight, this is the recipe that I use; I will be making some this afternoon. Rub the fat into the flour until it resembles breadcrumbs. Mix the egg yolk, water and lemon juice together and add to the flour mixture, if it is a bit sticky add some more flour or a bit crumbly a little more water, then gather the mixture into a ball. Roll out the pastry, cut out the bases with a round cutter, large enough to fit into your bun baking trays (I use shallow trays) and a pastry star for the top with a star shaped cutter. 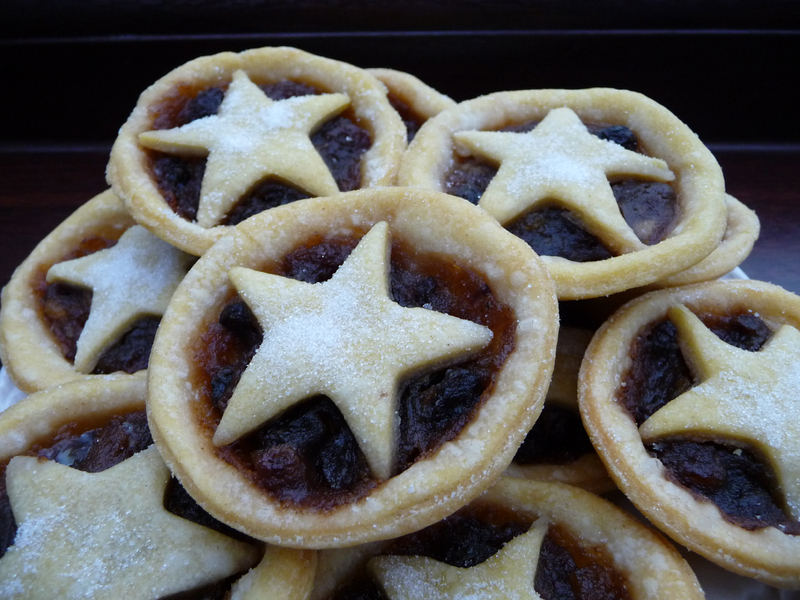 Place the round pastry bases in your bun trays, add a teaspoon of Mincemeat and top with a pastry star. Bake in the oven for 15-20 minutes at 180C. Leave to cool for 5 minutes before eating. Makes approx 36 mince pies – enjoy. We would like to wish you all a very Happy Christmas and a wonderful New Year from Gardening With Children and everyone at The Recycleworks.